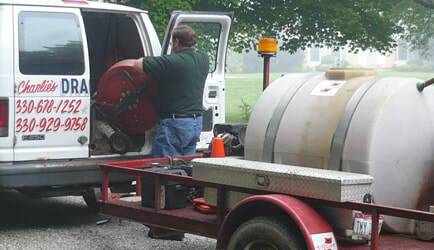 Charlie's Drain Service technicians are skilled at using the high-velocity water jet to clean dirt, debris and blockages from drain and sewer lines. What does it cost to use the high-velocity water jet? The cost of the high-velocity water jet, including one load of water, up to one hour of jet work, and drain cleaning, is $200. ​ This cost also includes two Charlie’s Drain technicians. If additional water or hours are needed or there are any services necessary to finish the job, a Charlie’s Drain Service technician will update you on the price before proceeding.